I recently got a copy of my aunt’s CV, submitted to West Valley College for employment, and the CV references where some of her work is placed in permanent collection. I immediately sent out inquiries, and the first to return an answer was the Sioux City Art Center, who shared this award wining watercolor my aunt painted and exhibited in 1953. Your aunt’s painting remains part of the Sioux City Art Center’s permanent collection. Attached is a reasonably decent jpg of Ecce Homo. We do indeed list Sister Mary James, Ann, B.V.M. as the First Prize Winner of the 9th Annual Iowa Watercolor Show in 1953, which came with a $100 prize. This exhibition opened at the Sioux City Art Center on November 5 and included 40 paintings by 28 different artists. After it was exhibited at the Sioux City Art Center, it appears that the show continued to Sanford Museum in Cherokee, Cedar Falls Art Gallery, the Woman’s Club of Hampton, Dubuque Art Association, Grinnell College, Younkers in Des Moines, Memorial Union in Ames and the Blandon Memorial Gallery in Fort Dodge. 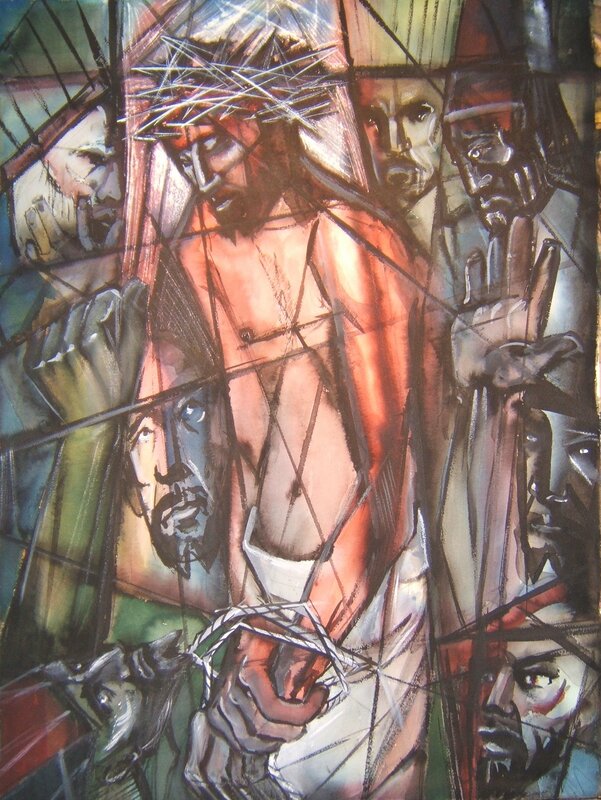 Ecce Homo measures 28.5 x 21 inches and is the only work by your aunt that was included in the 1953 watercolor exhibition and the only work by her in our collection. It is not dated, but we assume it was created in 1953 (all entries had to have been created between 1951 and 1953). Her work was purchased by funds donated by the Sioux City Woman’s Club, which helped organize the exhibition. Sister Ann has exhibited widely in Iowa shows and her work also has appeared in national exhibitions. Her honors include first prizes in watercolor in the Northeast Iowa Artists’ show at Cedar Falls and the Iowa watercolor show in Sioux City in 1953. Her work is marked with boldness of color, simplicity of form and richness of idea. The casual observer may find himself puzzled with the extreme stylistic variations in her work which typify the experimental approach used by many leading painters of today. Sister Ann expresses herself by new means discovered by herself alone. Her most noteworthy examples are found in the watercolor medium. Two strong paintings, similar in subject matter, represent her interest in transparent watercolor. A small painting entitled Fruit, and a larger one entitled Juicy Fruit are fine examples of her remarkable control of wet transparent watercolor worked in a brilliant medium. Excellent in designed structure is her whimsical Campus Corner. More academic than many in the show is her Composition, a realistic work, strong in design and painted in casein. Many of her paintings in the show contain either definite religious ideas or possess a spiritual quality akin to her religious beliefs. The large casein, The Christ, is an excellent example of a complete statement made possible by a minimum of detail. This exhibition was on view simultaneously with the 10th Annual Iowa Watercolor Show, for which your aunt served as one of the jurors. Thanks very much for the curriculum vitae. It will be a helpful addition to our artist file.